Preheat the oven to 220°C/425°F. Wash the sweet potatoes and beetroot thoroughly and dry. Halve the beetroots and sweet potatoes, then cut into large chunks. Mince garlic. Place the sweet potatoes, beetroot, and half of garlic in a bowl, season with cayenne, cumin, salt, and freshly ground pepper. Drizzle with olive oil and mix well. Transfer to a baking sheet and bake at 220°C/425°F for approx. 45 min. The vegetables should be slightly crisp on the outside and soft on the inside. In the meantime, in a small saucepan, cook the quinoa according to package instructions. Set aside and allow to cool slightly. Mince remaining garlic. For dressing, add miso paste, honey, almond butter, oil, lemon juice, garlic, and ginger to a small bowl, and mix thoroughly. Season to taste with salt and pepper. If the dressing is too viscous, add some water. Transfer the quinoa to a plate and drizzle with dressing. Sprinkle roasted sweet potatoes and the beetroots over it. 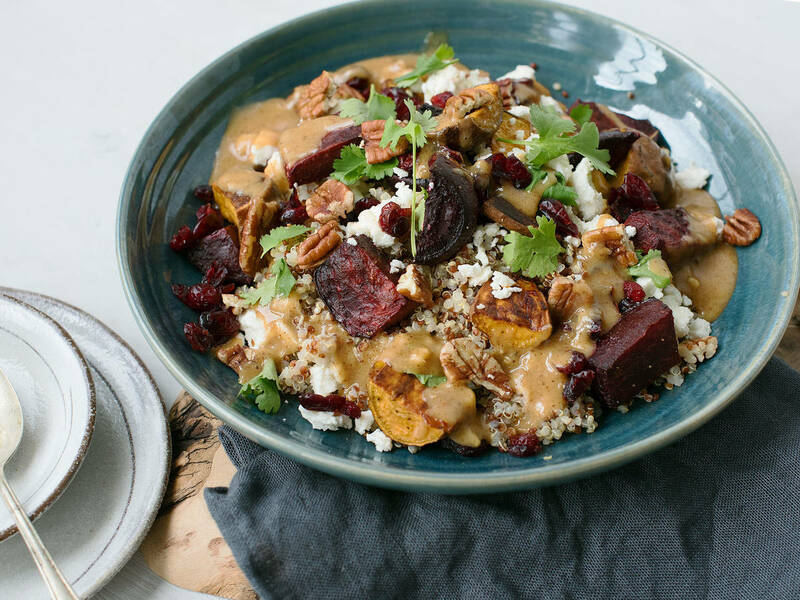 Serve with cranberries, pecans, crumbled feta, and cilantro leaves. Enjoy!